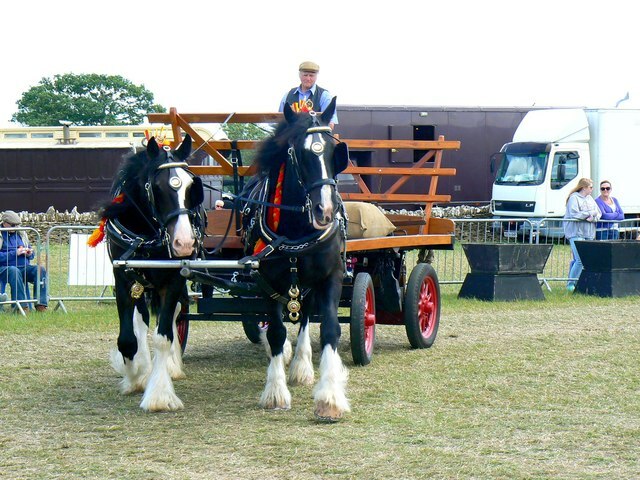 Whilst the show concentrates mostly on mechanical transport and agricultural systems, there is also room for older, more natural techniques of moving goods about and working the land. This pair of splendid carthorses makes the point. Although the modern world has largely moved on from such bucolic devices, at least in the First World, animals such as this still have a role to play in some circumstances, such as forestry, beer delivery and public relations. It is worth comparing the pros and cons of man-made and God-given modes of transport. Trucks can be switched off, parked and forgotten until needed again whereas horses have to be fed and watered on a daily basis even if not needed in the immediate future. Horses have also to be driven round the block as it were to keep them in shape whereas trucks need maintenance on a less intense schedule. On the plus side, the exhaust emissions from horses are mostly both biodegradable and recyclable meaning that horses are not subject to the Congestion Charge. Also, whilst it is possible to be charged with being drunk in charge of a horse, the evidence suggests that you have to be really under the influence and you won't get points on your licence. Perhaps the biggest advantage horses have is in the area of fleet renewal. Not even Henry Ford was able to build trucks that are capable of reproducing themselves.